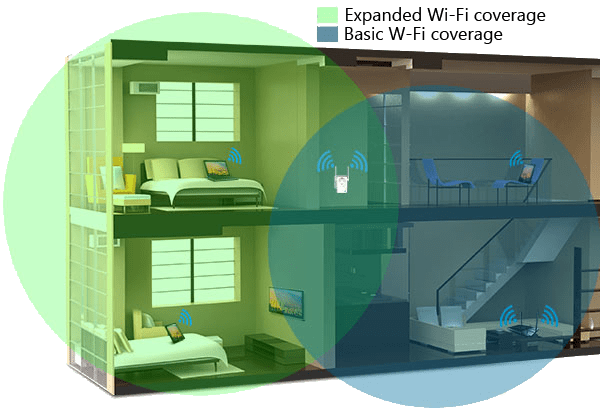 Simply put, Wi-Fi allows you to connect your devices to your Internet connection wirelessly. Before Wi-Fi was invented, you would have to connect a cable directly from your device to your internet connection. Remember dial-up? Once upon a time you would have to sit in front of your computer, initiate your internet connection and wait patiently to be connected to the world wide web. All while listening to a series of beeps and tones. Now thanks to Wi-Fi, we can roam from room to room while still being connected to the internet. Your Wi-Fi router transmits data to your device using radio waves. The strength of this signal is represented on your device by a series of bars that get lower as the signal from the router gets weaker. The further you are from the router, the weaker the signal will be and the slower your speeds. Obstacles or obstructions in your home can also deteriorate your Wi-Fi signal e.g. Thick stone walls, foiled plasterboard and even the position of your router. What is the difference between Broadband and Wi-Fi? Wi-Fi is everywhere these days and is synonymous when talking about internet access. People often confuse Wi-Fi with internet but you can still have Wi-Fi even without an internet connection. Wi-Fi just allows you to connect to the internet Wirelessly. Broadband is a way in which people access the internet, usually a service that runs over a cable (the cable that runs into your Wi-Fi router). Your broadband connection or Fibre Optic connection is connected a modem or router. These routers have Wi-Fi built in to allow you connect to them easily on your mobile devices. Will I have WiFi all over my house? Thickness of Walls e.g. Stone Walls. Building Materials E.g. Foiled back plaster board. How many obstacles the signal passes through before reaching your device. Your devices processor and Wi-Fi card. Radio Interference from other 2.4Ghz equipment e.g. Baby Monitors. Your Wi-Fi router should be positioned in either the centre of your home where most of the rooms are visible or in the area it will be used most. Most houses will need a booster or another router of some kind to adequately cover all rooms with a strong Wi-Fi signal. In the image below, you can see the coverage one router provides. The device that is in the same room as the router has an excellent signal but the signal in the room next door is weaker because it has to travel through a wall to the device. The next image shows how the signal handles a wall that is reinforced with metal which greatly impacts the Wi-Fi coverage. The room next door that should have very good Wi-Fi coverage now has no signal due to this obstruction, even though you are physically close to the router. The image below shows how devices in your home can impact Wi-Fi signals and ultimately cause areas of your home to have poor Wi-Fi coverage or blackspots. The TV is interfering with the Wi-Fi router due to the Electromagnetic Interference naturally created by a TV’s operation. This is what causes the poor coverage within the room and impacts the coverage that is sent to the second and third room. The cordless handset is also a source of interference and reduces the signal further. That is why the device in room 3 cannot pick up the Wi-Fi and cannot receive a connection to the internet. A Wi-Fi repeater or extender is used to extend the coverage area of your Wi-Fi network in your home. It works by receiving your existing Wi-Fi signal, increasing it and then spreading the boosted signal. A Wi-Fi repeater can help you boost the Wi-Fi signal to reach far corners of your home. The benefit of repeaters is that they are cheap and easy to set up. The downside is they have to receive a good enough signal in the first place to accurately boost and extend the coverage. They won’t work well where thick walls or obstructions are blocking the signal from reaching those rooms. Powerline extenders work by using the wiring in your house as a means of transferring the internet connection from the router to the area with poor coverage without the hassle of running a cable from the two points. One adapter is plugged into your Wi-Fi router via the provided cable, the other is plugged into the area with poor or no coverage. The two sides are paired together by the touch of a button. Internet access is now in this room. There are two variants of powerline extenders, standard or built in Wi-Fi. The standard extenders just bring the connection to the new adapter you’ve plugged into the wall. You can plug this cable directly into your TV or games console. You could also plug the cable into a second Wi-Fi router to have increased Wi-Fi coverage. The second version is Powerline extenders with built in Wi-Fi. These bring the internet connection to the room where the adapter is plugged in but it sends out its own wi-fi signal too. The benefit of powerline extenders is that they can add wi-fi to areas of your home that have no coverage whatsoever, even a shed or garage as long as they share the same electrical circuit. The downside of adapters is the speeds can be reduced by poor wiring in your home. Powerline adapters are very popular as they are low cost and can be found in any computer or electrical store. Mesh Wi-Fi networks are the latest in Wi-Fi technologies and offer the best solution for coverage in your home. They are often referred to as whole home Wi-Fi kits. Mesh networks operate by placing several routers in your home that communicate with one another to provide the best connection possible. You may wonder, How’s that different from a router and an extender? Mesh Wi-Fi routers are built to work in tandem with one another. If you purchase two mesh routers but still want full bars of Wi-Fi upstairs at the opposite end of the house than you can simply buy another mesh router and it will easily integrate with the rest. Not only do these types of routers boost coverage in your home but they will provide you with the best speeds over all the other products because they are adaptable. The routers will change channel if interference is detected or will try to provide the best speed to one user without neglecting the rest. They also have what is known as seamless roaming. When you use a booster or extender, you may have two Wi-Fi networks appearing on your phone. When you move upstairs, you click on upstairs Wi-Fi and vice versa when downstairs. With Mesh systems you just walk from room to room without a care as the routers or nodes will move you to the best signal possible instantly. While they may be more expensive than repeaters or extenders, the cost is definitely worth it. An excellent Wi-Fi network is an investment but a very important one. I know what you’re thinking, why invest in Wi-Fi when the router I have is fine and a booster might do the trick. That new smartphone in your hand, the €1000 4K Ultra HD TV hanging on the wall, right down to the €80 Tablet your using all connect to one single device in your home…the Wi-Fi router. The most important thing is to have a fast and reliable Internet connection, which you will have from Ivertec. Once you have that, the Wi-Fi network is yours to play with, so why not invest now. You’ll thank us later. If you would like some advice regarding Wi-Fi, you can email info@ivertec.ie and we will be happy to help. What’s the difference between 2.4 GHz & 5 GHz? The main differences between the two frequencies are the coverage and speed that the bands provide. The 2.4 GHz band provides better coverage at a longer range but transmits data at a slower speed. The 5 GHz band provides less coverage but transmits data at faster speeds.